We are gonna give away new users starter packs (worth $15) for New World Empires. Codes are only valid for new users and you will be able to redeem yours until October 23. 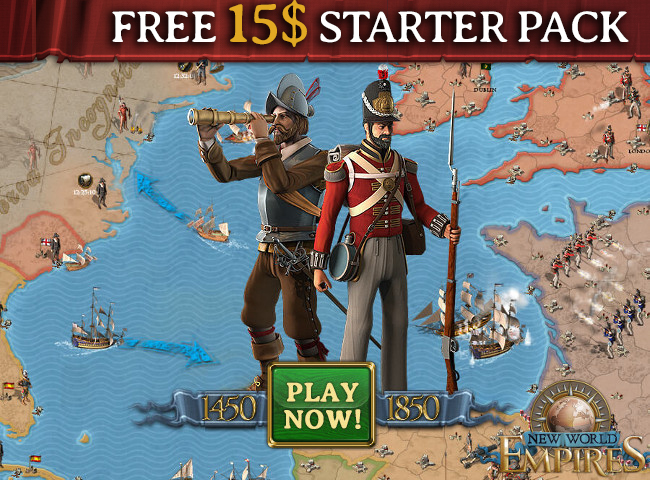 New World Empires is a free to play strategy MMO for Internet Browsers that takes you to Europe during the 19th Century. You'll have to manage your own country, raise and army and colonize new lands on a different continent. The code will provide you with 1 month of premium subscription and 25,000 in-game coins. Step 3. Visit New World Empires and create an account. Step 4. Items will be given when you complete the tutorial. This entry was posted on Thursday, October 6th, 2016 at 4:48 pm and is filed under MMO News. You can follow any responses to this entry through the RSS 2.0 feed. Puedes dejar una respuesta, o un trackback desde tu sitio web.